Looking to let go of a little "mommy guilt" for using the television now and then to give yourself a breather? There may be plenty of evidence that leaving children to watch too much television is a bad idea, but there is something to the idea that educational TV is, well, educational. We have the brain scans to prove it! A study published in PLOS Biology used functional MRI scans to check out the brains of 26 children and 20 adults while they watched 20 minutes of Sesame Street. The actual purpose of the study wasn't to find out if Sesame Street was educational per se. Rather, it was to observe the neural processes in the brain while a child is learning "naturalistically" and then see whether what they saw could predict how well the children would perform on standardized IQ tests. Often, participants in studies receive fMRI scans while they are doing some sort of task that is supposed to simulate learning and/or stimulate certain neural processes. For example, a study subject might be asked to put together a three-dimensional puzzle on a computer (so their head remains still enough for the scan) to see how the brain interprets spatial relations. However, these sorts of oversimplified "lab" tasks are not always representative of real-world activities, so it's not clear whether what the researchers see on the brain images during these tasks is necessarily indicative of what REAL-life spatial relations thinking looks like. Are the neural processes seen in an fMRI scan while putting together blocks on a computer screen the same as what's seen in the brain while a person builds a treehouse? In this study, the researchers found a partial answer to exactly that kind of question, and the answer is no. 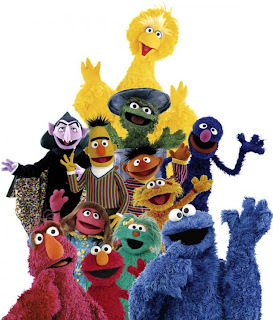 The children in study, ranging in age from 4 to 11 and all typically developing, watched the same 20-minute montage of short clips with Big Bird, Cookie Monster, the Count, Oscar and the rest of the gang teaching numbers and letters, shapes and colors, planets and countries, and so on. Meanwhile, the fMRI was taking a snapshot of their brain every two seconds. The fMRI (which uses a giant magnet, not radiation, to peek into the brain) works by dividing the brain into a 3-D grid so that it can measure the intensity of the brain signals in each little section (about 40,000 of them, called voxels). The researchers collected a total of 609 images of each participant's brain, which they could then use to map out the neural processes of the participants while they were watching. They also had the children (23 of them), in a separate fMRI scanning period, perform a one of those lab-only fMRI tasks. In this case, the kids matched isolated pairs of faces, numbers, words and shapes on the computer (they pressed a button if the two images shown matched) while the fMRI images of their brains were created. Finally, the children (19 of them) took IQ tests that primarily tested their math and verbal skills. Then the researchers analyzed the maps of neural processes in the children and their comparisons with the adults. They found a couple of interesting things. First, the kids whose neural "maps" were most similar to the adults also performed the best on the IQ tests. This means kids' brain structure matures in a predictable way, which the researchers called "neural maturity." "Broadly speaking, the children showed group-level similarity to adults in cortical regions associated with vision (occipital cortex), auditory processing (lateral temporal cortex), language (frontal and temporal cortex), visuo-spatial processing and calculation (intraparietal cortex), and several other functions," the authors wrote. The fMRI scan on the left represents correlations in neural activity between children and adults, in the middle between children and other children, and on the right between adults and other adults. Such neural maps, says University of Rochester cognitive scientist Jessica Cantlon, reveal how the brain's neural structure develops along predictable pathways as we mature. Second, the brain maps created during the Sesame Street viewing accurately predicted how the children performed on the IQ tests. Kids who did better on the verbal tasks showed more mature neural patterns in a part of the brain that handles speech and language, called the Broca area. Meanwhile, the kids whose math scores were highest had more neural maturity in a part of the brain that processes numbers, called intraparietal sulcus. But the researchers' other finding was that those areas of neural maturity seen during Sesame Street viewing — the ones that matched up with the children's scores on the IQ test — were not seen during the fMRI task of matching faces, numbers, words and shapes. Basically, the "let's try to simulate what learning looks like in the brain" task designed specifically for fMRI scans didn't help much. But the more naturalistic, organic learning that takes places while watching Sesame Street did work. Researchers now know they can use activities like viewing educational TV to scan children's brains and learn more about how they learn — and it's more accurate and helpful than invented computer tasks. It's possible this technology and research could be applied to understanding better what's going on with certain learning disabilities. But a nice additional finding is that, hey, Sesame Street really IS educational! Of course, my son’s favorite show is a different PBS production — Dinosaur Train (which I admit I enjoy too) — so I also feel a better that little D spends a half hour or two, several days a week, learning from Buddy the Tyrannosaurus Rex, Tiny the Pteranodon, Mr. Conductor and Dr. Scott the Paleontologist about dinosaurs, carnivores, herbivores and how to test a hypothesis. All aboard!